If you thought that the fact that outsiders Ted Cruz and Donald Trump are leading the Republican presidential field by a wide margin signaled the demise of establishment Republican control of Washington, think again. While all of the grassroots conservative attention is focused on the presidential race the special interests that pull the strings on Capitol Hill are quietly pouring millions of dollars into campaigns to defeat conservative congressional challengers. Just days after the Congressional Leadership Fund swooped into TX-08 to help establishment GOP Rep. Kevin Brady in his primary, the group's sister nonprofit, American Action Network, is making a $200,000 independent expenditure backing establishment GOP Rep. John Shimkus in IL-15. The bulk of the spending is for a broadcast and cable buy covering five markets, but it includes a digital and GOTV phone call component as well. The spot calls Shimkus "a strong conservative voice" and portrays him as a fighter against Obamacare and Planned Parenthood and for gun rights. 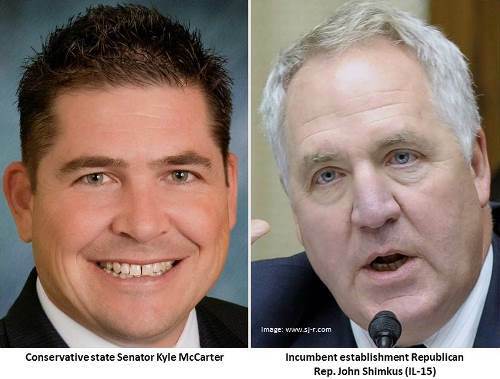 — Shimkus faces Club for Growth-endorsed state Sen. Kyle McCarter in the March 15 Republican primary. In our article “Boehner Friends Attack Conservatives Prop Up RINOs In Corrupt Alliance With Obama” we told you about the American Action Network and its close association with former Speaker of the House John Boehner and how it was founded by lobbyist Barry Jackson, Boehner’s long-time Chief of Staff and political confidant. John Shimkus is no conservative, and he is certainly no fighter for any part of the conservative agenda – Shimkus, is an entrenched establishment Republican whose record includes everything conservatives are angry about with Washington. Shimkus is no conservative; he’s a reliable do-boy for the Republican establishment’s Capitol Hill leadership and the lobbyists who fund the American Action Network. Conversely, state Senator Kyle McCarter has received endorsements from conservative organizations such as the Club for Growth, The Eagle Forum, Taxpayers United of America, and Family PAC of Illinois. The citizens of Illinois deserve better, and Americans deserve better. The conservative choice in IL-15 is state Senator Kyle McCarter – we urge all of our friends in Illinois Congressional District 15 to vote McCarter in next week’s Republican primary election.